Budget friendly Thanksgiving tablescapes start with using nature for decor. Learn how to make a table setting using leaves & branches from your own backyard. Imagine our surprise when a week before Thanksgiving we watched a tree fall down in our backyard – split right down the center. Thankfully, everything was fine and no damage happened to anything other than the tree. But, we had to take care of it quickly before having guests over for Thanksgiving dinner. Most of the family members saw the incident as an annoyance, but I saw it as a golden opportunity. You see, I was still unsure how we were going to decorate our table for Thanksgiving dinner. It seems I was experiencing a bit of a design block. But, once that tree came down, I knew exactly what to do. I grabbed as many branches as I could. I didn’t even worry about how to arrange them yet. At that moment, it was all about quantity. Pro tip: Keep freshly cut greenery in glasses or buckets in a cold environment to help them last longer. If temperatures aren’t yet to freezing, your back yard or porch can be a great place to do this. I kept our branches in buckets on our back deck, right outside the sliding glass door. On Thanksgiving day, the branches were beautifully intact and lush. All we needed was a way to hold them. Basically, if it’s flat enough to hold a water-tight vase, or can act as a water-tight vase, it’s worth trying! We ended up using leftover wood boxes from my rustic holiday tablescape and a wooden crate I bought from Ikea several months earlier. The base of your table is also all about using natural elements. Think wood or woven placemats, burlap table runners, and crisp white plates. We chose to use brown contractor’s paper as an extra wide table runner, and as a base for the island buffet. Woven hyacinth placemats and high–quality white disposable plates rounded everything off perfectly. Best of all, it was easy to setup AND easy to take down! Most of the decorating was just sticking branches into boxes, and layering with other elements we already had on hand. And the brown paper ‘tablecloth‘ and disposable plates meant that we were able to clean up via recycle bin instead of dishwasher. Score one for easy! Favorite seasonal decor that has been collected over the years. Framed bits of fabric or napkins that fit the theme. Tip: Many printables are provided in high print quality, which means they can be printed in much larger sizes than originally intended. To make our chalkboard sign, I had a poster-size print made of this free printable, and then used spray adhesive to quickly glue it to foam core. How long did it take to pull together? Because I already had the metal vases, boxes, and hyacinth placemats the whole display only took about two hours to pull together. Which means I was able to focus more of my time on important things like cooking the food and mingling with our family members. Because we had so much on hand already, I estimate that we only spent about $100 on decor to take care of a buffet table, dinner table, and appetizers. Absolutely! I love decor that is both disposable, recyclable, or biodegradable. 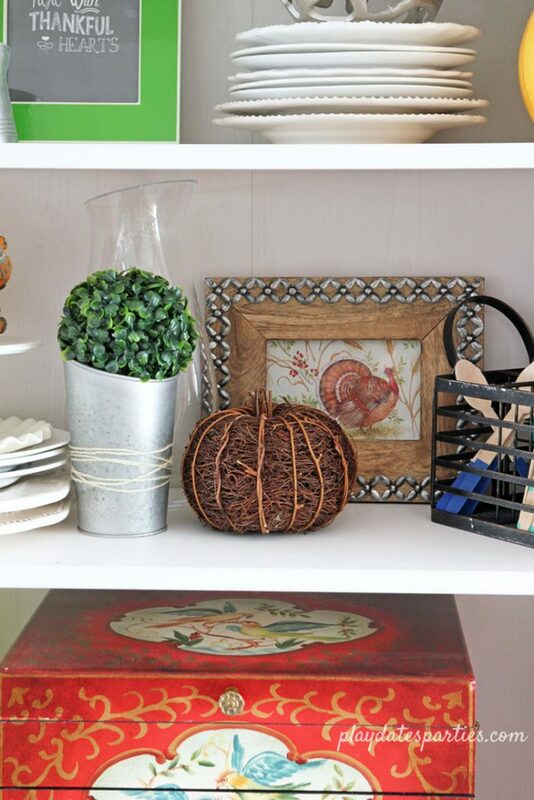 Plus, the other decor elements can be used in any number of ways throughout the home once the holiday is over. While it may seem wasteful to use so many disposable items, I believe that it is better to use items that can be recycled than to purchase decor that will sit wasting space in a home for years to come. 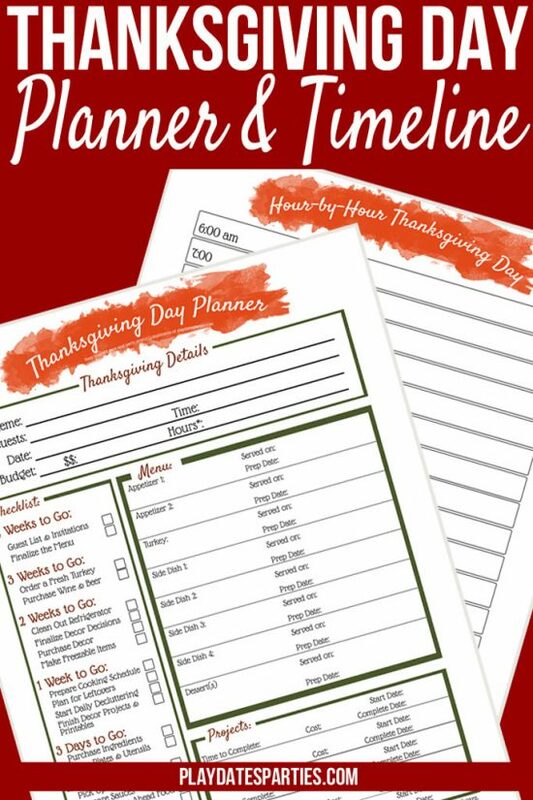 Get your printer-friendly copy of these tips and then walk out into your backyard to take a look at what you can use to decorate this Thanksgiving. And don’t be afraid to make your table more casual. 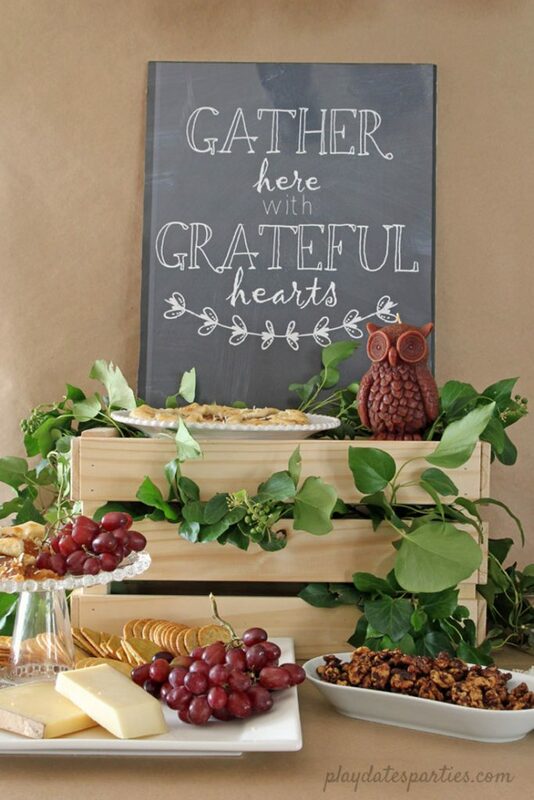 It’s a wonderful way to make your guests feel more relaxed and welcome. Very cute ideas! I always struggle with decorating around Thanksgiving for some reason. Great ideas! Depending on what’s growing (naturally) in your area, you can “shop” your backyard. I think Thanksgiving is the one holiday that gives you so much creatively in how you decorate. Visiting from Nifty Thrifty Sunday party. I love the idea of using natural greenery for the table. it looks really pretty, especially with the white candles for contrast. Thank you for sharing your inspiration at The Really Crafty Link Party this wee. Pinned! Wonderful ideas! Thank you for the great decorating tips! This is so pretty and thanks for the inspiration! I’m sorry you lost your tree, but this is a great way to give it a good sendoff! Thanks for sharing with Party in Your PJs! Bringing the outdoors in is a beautiful way to celebrate Thanksgiving. It is definitely another way to enjoy the season’s bounty. Thank you for sharing your ideas with us. I can’t wait to give some a try – and thank you for sharing this week at our Hearts & Home Blog Hop! Great ideas! I love natural decor so much. Thanks for contributing to the To Grandma’s House We Go Link party this week! Be sure to follow us and we’d love to see you next week! post! Thanks again for linking. Come every week and link any day any time! Thank goodness you or your family weren’t hurt by your tree falling! But I love how you have turned Lemons into Lemonade! I love how you have added the greenery to your tablescape! Thank you so much for sharing your beautiful tablescape with us for Waste Not Wednesday! It’s always a good idea to use nature for our decoration. Thank you for the inspiring post! I love this idea and have been doing it myself for many years. Nothing is nicer than to see nature in your home. Especially during thanksgiving. Hi. Two Chicks and a Mom Featured your amazing post at Snickerdoodle Link Party today–hope you can stop by! It looks warm, inviting and relaxing. Thank you so much for sharing these great ideas. I am so excited about decorating my table. Great ideas and so pretty! You were one of my features this week at Best of the Weekend! I love using natural elements in my decorating and I love how you were able to take the negative of losing and tree and turn it into a beautiful table and display for Thanksgiving! Thank you for sharing at Merry Monday. I’ll be including your table in my Party Features this week.